Please view our 2 minute video presentation about Your World Heritage Sites and Biospheres below (scroll to the bottom). And then, if you like what you see, please spread the word by clicking the social media icons next to the video. We would love to hear from you, so post questions and comments in the box provided and we will reply (teachers, please encourage you students to send their questions). We’ve have been following this passion to explore wild places since we were newly married. On our honeymoon, way back when, we took a road trip from Johannesburg, South Africa to Lourenco Marques, which only wetted our appetite for more adventures. In the ensuing years, travel proved to be a natural outlet for Boris’ passion for photography, which began as a teenager, lugging around a beat-up, borrowed camera. Travel also sparked my love for writing, which began with my first childhood travels by train from Johannesburg to Cape Town, South Africa. Shortly after that, The Johannesburg’s daily newspaper published our very first article on the Imfolozi-Hluhluwe Game Reserve, in KwaZulu, South Africa. That’s where the last few hundred white rhino hang on from the brink of extinction.Since then, we’ve had the privilege of exploring and documenting some of the world’s most beautiful and diverse wild places—just to name a few: Lauca National Park, in Peru, The Kruger National Park, in South Africa, and Waterton-Glacier International Peace Park, in the US and Canada. Over the years, this melding of our passions has created a rewarding and unexpected synergy. It has inspired us to share our wide-ranging travel experiences through presentations to educational and conservation organizations, and through photographs, videos, travel books, blogs and on social media. Closer to home in Alabama, we delight in exploring the Southern Appalachians, which have been designated as a International Biosphere Reserve. We travel the Southeast United States to research and produce videos for the ecological mystery series we write for upper elementary and middle grades. Why? Because we want to inspire young people to become wise stewards of our precious natural heritage. We never fully anticipated what a rewarding journey writing those eco mysteries would become! Along the way, we’ve had the privilege of meeting dedicated scientists, working to save endangered species; outstanding teachers, educating and motivating kids to take action; and an “army” of conservationist, showing the way to “green” living. So what would we do if we were awarded the $50,000 to follow our passion for preserving our planet’s rich cultural heritage and amazing biodiversity? We would explore and document two contrasting International Biospheres, some of which are threatened by wars, climate change, and manmade problems. Two possible examples are: the Tasmanian Wilderness in Australia, and the Pantanal Complex in Brazil. When we discovered that few people seem to know much about these incredibly important Heritage Sites and Biospheres and their mission, it fueled our conviction for the value of our project. 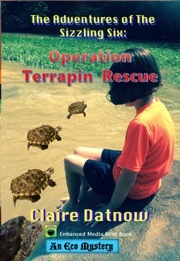 To date, there are no ibooks on this topic that combine HD 1080p video, HD images, and interactive slide shows tightly integrated with enjoyable text written for a general audience (for examples of our ibooks visit the ibook store—key words Claire Datnow). So, we invite you to participate in this journey! And we want to share our experiences with as broad an audience as possible. To this end, we will post blogs, photographs, and videos of our expedition on our website and social media to inform, excite, and inspire people of all ages and all walks of life to support, in ways small a large, what is being done at the at these irreplaceable sites. At the end of journey, we will create a visually beautiful, informative, and inspiring ibook for National Geography to distribute and to share with the world. For us, this project will be a labor of love, another leg of our journey of discovery, and another way to share our experiences and dedication to saving wild places for generations to come. 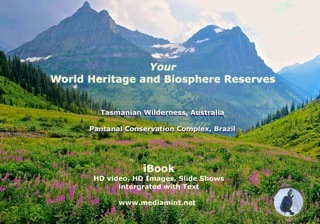 Please view: World Heritage and Biosphere Sites — 2 minute video presentation.